Since 1988, Eco-Tech Inc. has provided sales and service of engineered equipment to the municipal water and wastewater industry. With a strong emphasis on comprehensive solutions, Eco-Tech Inc. acts as a regional equipment supplier for the municipal water and waste industry. We also provide service, support and warehousing facilities. In order to keep up with industry changes, Eco-Tech makes necessary adjustments to take full advantage of new technologies that meet the needs of the municipal industry. Over the past few years, Eco-Tech has enhanced our expertise to include a wide range of membrane and ion exchange technologies as well as enhanced conventional process technologies. We are constantly looking to find products and solutions to better service our customers within a cost effective and regulatory approved environment. We are active in both state and local professional organizations and strive to be on the cutting edge of regulatory and technology issues that allow us to best serve the municipal industry. Eco-Tech works well with all types of standard and alternate equipment procurement and delivery systems. Whether providing equipment through general contractors and engineers or directly to municipal owners, Eco-Tech delivers well-designed equipment systems that fully achieve project parameters within functional life cycle cost objectives. Eco-Tech is an employee-owned company, formed in 1988 in Holly Springs, GA. Although our center of operations remains the 30,000 square foot Holly Springs warehouse/office facility, we also have branch offices in Nashville, TN, Montgomery, AL and Little Rock, AR. 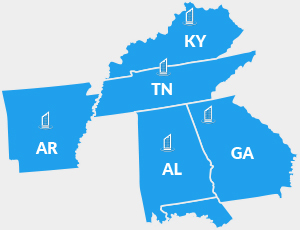 Our business operations span the southeast, covering Alabama, Arkansas, Georgia, Florida Panhandle, Tennessee and Kentucky. At Eco-Tech, we believe in the total installation concept, which means we aim to provide a complete working equipment installation. We work with municipal owners, a wide range of equipment manufacturers, design engineers and local distributors and contractors to get the job done. Eco-Tech’s team approach breaks down the traditional equipment procurement cycle into several components, from concept through installation, service and support. By having focused teams work on each phase, we are able to make the most of every team member’s expertise, helping us to maximize our effectiveness to our customers. Eco-Tech, Inc. currently has over 30 employees, of which 12 are full-time sales staff. The majority of our sales people are degreed engineers. We also operate our own customer support and field service crews to make the equipment delivery and start-up process best meet the needs of our customers.